Our Hard Drives Case Bag With Simple And Generous Design. All Of Them Large Capacity,Waterproof And High Applicability. Double Zippers Design With High Quality Zipper Hardware To Make Sure All Products Durable. 1. Portable, Earthquake,Anti-pressure,Upscale,Fashion,Mobile Hard Disk,Generous And Simple Appearance. 2. Easy Access Mesh Pockets Expand To Store Multiple Sizes Of Electronics Accessories. 3. Universal Shockproof Hard Carrying Case For 3.5 Inch. 4. Easy And Convenient For You To Carry The Case With The Strong Lanyard. 5. Environmental, Have Not Any Material Bad For Health. Also We Use One Of The Best Materials To Produce Instead Of Poor One. This Electronic Accessories Storage Bag Is Made With EVA Material, May Have Some Special Smell, If You Are Not Used To It, You Could Just Open The Package And Put The Bag In A Ventilate Place For A Few Hours, Then The Smell Will Fade Away. This Storage Package Has Enough Space For Your All Kinds Of Memory Cards, USB Flash Drives, External Hard Drives, Cellphones And Power Banks. This Multifunction Big Capability Electronics Accessories Travel Organizers Keep All Electronics Accessories Organized And Easy To Find. Versatile Electronics Accessories Storage Organizer Specifically Designed For Well Organized People And Travelers. Built-in Soft Sleeve Case And Strap,Dual Buffer Layer Protects Electronics Accessories With Carabiner Clipps. 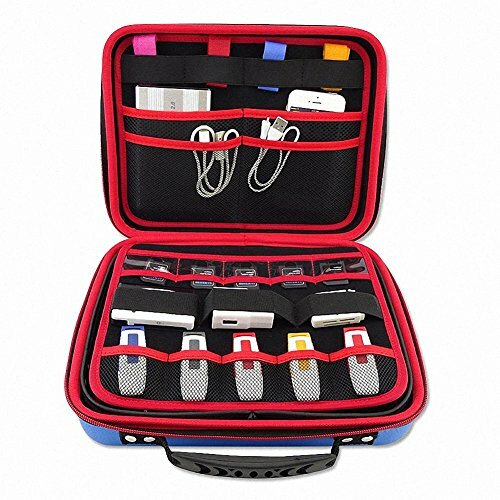 This Travel Case Shockproof, Waterproof, Compression, Portable, Multifunction Storage, Great For Travel. If you have any questions about this product by GUANHE, contact us by completing and submitting the form below. If you are looking for a specif part number, please include it with your message.